While quick and dirty Google Trends is definitely not data science it can be useful for a sniff test. I was working on a client project today, when I thought I would look at search interest over time. Rails- we’d expect to be tailing off a bit. Node.js – I actually expected to see more of an upward slope, after a it had felt like it was plateauing for a while. Node is definitely still growing strongly in adoption. But Golang – I was certainly not expecting this kind of sustained upward slope in interest, in terms of volume. Language interest can grow quickly, but tends to plateau pretty quickly too, as populations become saturated. 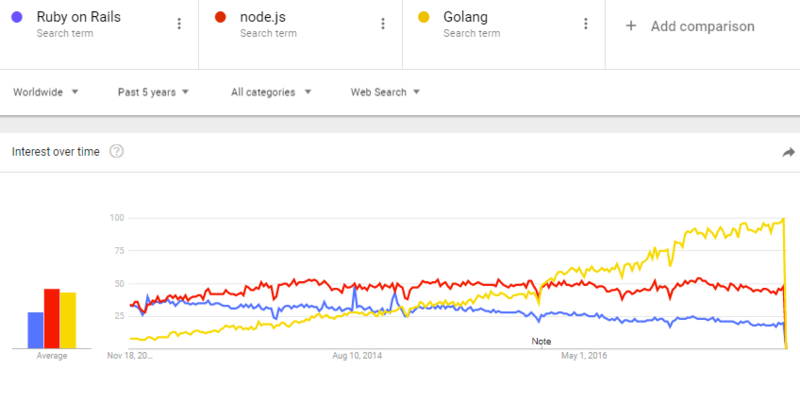 Golang is showing sustained growth in interest over time though. But judging from the graph Go could end up doing something rather more interesting.